How would you like to win some blog candy??? 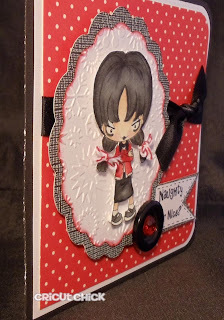 One of the Cardz TV stamp sets called "Holly Jolly"
paper kit from Crate Paper! AWESOME! Thank you! hop along and you will be entered to win! 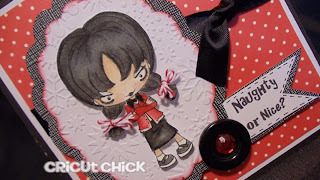 Mary at Cardz TV Stamps. be able to win the great prizes. Love the bold colors you used! I think she is misunderstood, nice underneath!! Cute card! I love your card, Julie. You did a fabulous job with this little girl and making this card extra special. Merry Christmas! ow stinkin cute is she. Reminds me of my granddaughter. Yes I think is just misunderstood and what a fabulous job you did!! Wow your card is just so cute. Love that image. I am glad to be in the hop with you. The look on her face is naughty...lol. Very nice card. She's a little naughty but fun. She is a bad girl. You can see it in her eyes. Great job and your colors are great. thanks for your time and talent. Your coloring is really nice! Thanks for sharing. I love this & your coloring. I think she is TRYING to be nice...LOL! I totally need that card for my niece. lol! I like the red and black look. TFS! Too cute! Maybe more naughty than nice. Can't tell if she's naughty or nice, but your work is Great! I love that color combination and that you put twine on her pigtails. Very cute! Haha, she reminds me of my how my son would pout when he didn't get his way! She is too cute! Love that card. The colors are great! Super cute image. Oh how cute is that digi...great for use with naughty or nice. Great card. Love it. She is really cute, so of course she's nice!, lol. This is just too, too cute. I love how you colored the digi, and what a perfect image for Mary's stamp. 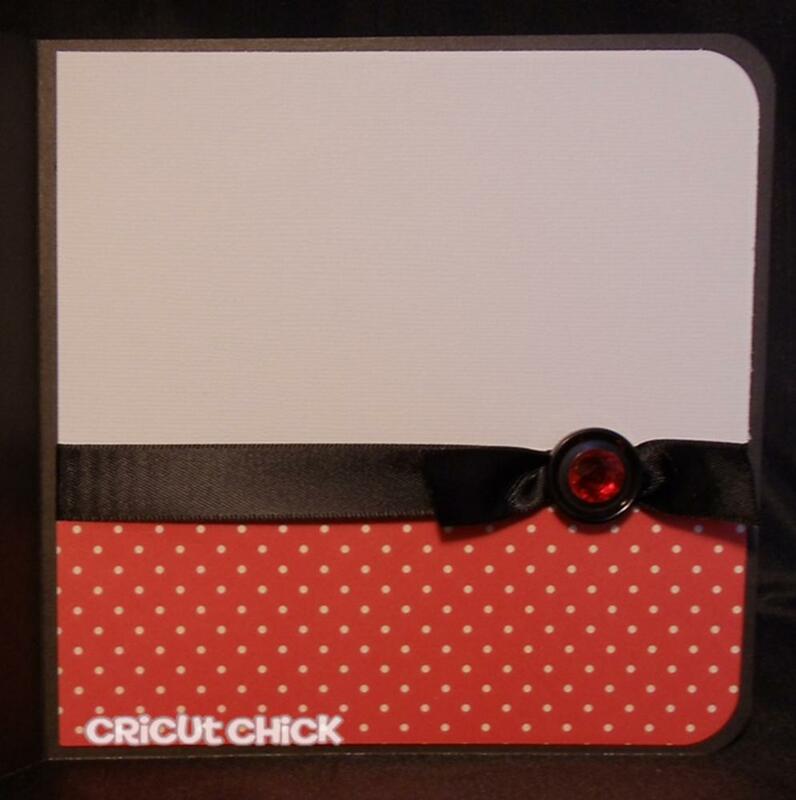 I like the embossing on the background and the black bow. Both just add so much to the card's meaning. The look on her face says she's been naughty but she is sweet! Great job julie! Too cute. I love the image you used, it's so perfect for the sentiment. TFS. Super cute card! I love the bows in her hair! Great job my friend! You are a master at coloring these images. Love the inside of your card! Thanks for sharing. I really love this card! I like when cards for holidays are "off the beaten path". I think Wednesday is a perfectly naughty little girl! Love the red dot paper and the ribbon! She is misunderstood of course! Really cute card. Merry Christmas. Adorable card, and she looks like she is daring anyone to say naughty. LOL She is just too cute. She's a nice girl. Cute card. What a cute card. Looks like she may have been a little naughty. She looks a little naughty to me! I love the twine you tied in her hair! Like the layout of your card. She better get what she wants for Christmas! That looks like my DD. Love the card! She is cute! Merry Christmas. That is so cute. That sentiment is just so perfect for that TGF Image. Oh I agree, I think she's just misunderstood, lol. Darling card. I'd have to guess naughty, but she could be a surprise! Great talent. She looks naughty to me, bit oh so very cute. Lovely card. thanks for sharing. Oh so cute! Love the image with Mary's sentiment. Very clever. Your girl is so cute, you did a fabulous job! Love the way you used twine! Great card! I love your card! She is sassy! Cute card, you did a great job on her! mmmm...I'm going with nice with an attitude! lol Merry Christmas and a Happy New Year! I like your card. She looks like trouble=). This is an adorable card! I think she looks just like my granddaughter can look when she thinks she won't get her way, "naughty" but still cute! she is naughty, but wants to be nice lol... very cute card. oh my gosh, so cute!!!!!! !Love the way you used twine! Not much left to say...Nice Job !! Great card!! You used the perfect digi to go with your sentiment. I think she is naughty!!! Love your card...love the colors and all the texture...Thanks. Very cute card, love the little girl. The little naughty girl is going to get a lump of coal. Great job. She is a cutie but not sure if she is naughty or nice. Definitely looks naughty! Cute card!